The Narrows View is a short overlook trail in the North Rim Section of the Black Canyon of the Gunnison National Park near Crawford, Colorado. 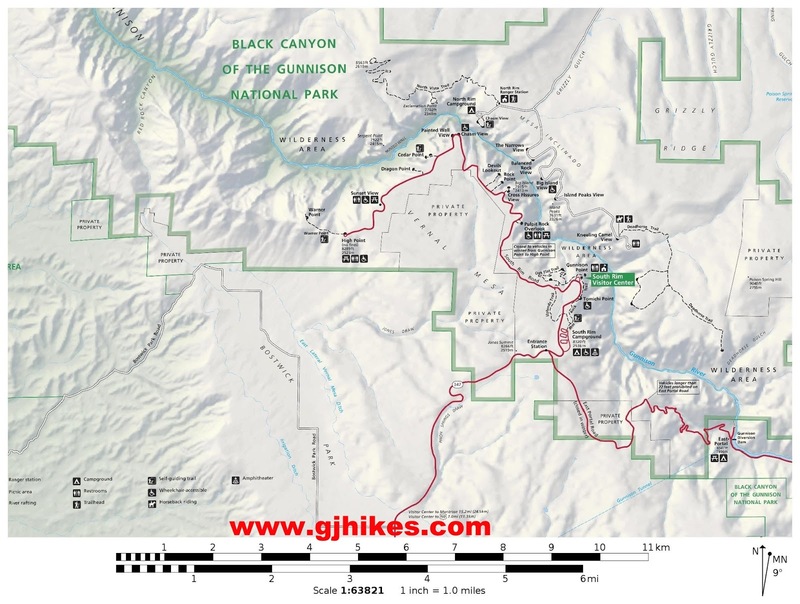 The trail makes a loop through the brush and wildflowers providing hikers with spectacular views of the narrowest area of the Black Canyon at the level of the Gunnison River. The trailhead is just over 1 mile from the North Rim Ranger Station. It is only a short distance before the canyon begins to come into view. The first few places where you can see into the canyon are unprotected making it rather dangerous trying to get too close to the rim. A well anchored fence a little further along provides the perfect spot for looking into the dizzying depths of the Black Canyon. Just think, you could put the Empire State building in the canyon and you would still have to look down several hundred feet to see it. At the level of the Gunnison River in the Narrows the canyon is only 40 feet wide. 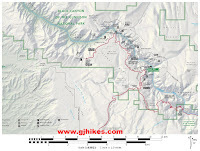 There are several rather steep trails that lead down to the river that require a permit to hike. The permits are free and can be obtained at the South Rim Visitor Center and the North Rim Ranger Station. Looking up the canyon in the other direction is pretty awesome also. If this coyote is any good at catching rabbits it should have a good life in the park. We saw at least a half dozen rabbits and numerous squirrels with no raptors or other coyotes. There are 5 or 6 of these short little overlook trails in the North Rim Section of the park. Most of them require little or no hiking and each one has its own unique view of the canyon that makes them all worth stopping at. Exploring the rim of the Black Canyon can be a very enjoyable day. All you need to do is remember to bring a picnic basket. If you would like to see it for yourself then all you have to do is 'Take a hike'.